Now greatly expanded in its second edition, Political Philosophy: The Essential Texts is ideal for survey courses in social and political philosophy. Offering coverage from antiquity to the present, this historically organized collection presents the most significant works from nearly 2,500 years of political philosophy. It moves from classical thought (Plato, Aristotle) through the medieval period (Augustine, Aquinas) to modern perspectives (Machiavelli, Hobbes, Locke, Rousseau, Hume, Smith, Hamilton and Madison, Kant). The book includes work from major nineteenth-century thinkers (Hegel, Marx and Engels, Mill) and twentieth-century theorists (Rawls, Nozick, Charles Taylor, Foucault, Habermas, Virginia Held) and also presents a variety of notable documents and addresses, including The Declaration of Independence, The Constitution of the United States, The Declaration of the Rights of Man and of the Citizen, The Universal Declaration of Human Rights, and speeches by Pericles, Edmund Burke, Abraham Lincoln, Elizabeth Cady Stanton, and Martin Luther King, Jr. The readings are substantial or complete texts, not fragments. In addition to the new selections noted above in bold, the second edition also includes more essays from Aristotle, Locke, Hume, Smith, Hamilton and Madison, Kant, and Mill. An especially valuable feature of this volume is that the works of each author are introduced with an engaging essay by a leading contemporary authority. These introductions include Richard Kraut on Plato and Aristotle; Paul J. Weithman on Augustine and Aquinas; Roger D. Masters on Machiavelli; Jean Hampton on Hobbes; A. John Simmons on Locke; Joshua Cohen on Rousseau and Rawls; Donald W. Livingston on Hume; Charles L. Griswold, Jr., on Smith; Bernard E. Brown on Hamilton and Madison; Paul Guyer on Kant; Steven B. Smith on Hegel; Richard Miller on Marx and Engels; Jeremy Waldron on Mill; Thomas Christiano on Nozick; Robert B. Talisse on Taylor; Thomas A. McCarthy on Foucault and Habermas; and Cheshire Calhoun on Held. 4. 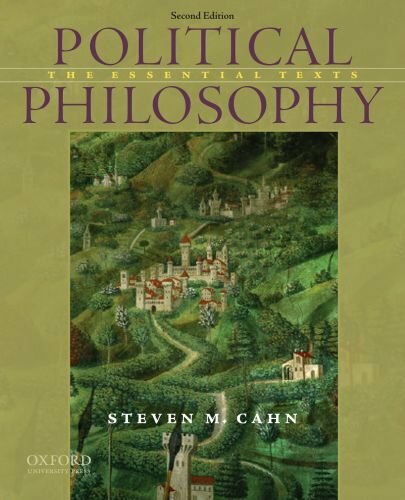 Political Philosophy: The Essential Texts Cahn, Steven M.
Political Philosophy: The Essential Texts Cahn, Steven M.